We are very excited to announce that Ellen Denham will be the 2013 director for our Unbrella Project. Ellen has participated in Indy Convergence several times creating hilarious, creative and always highly collaborative pieces like short play “The Singing Dog”, a interesting twist on “Peter, Peter Pumpkin Eater” and her woman loves lobster-man tale “Homo Homarus”. Below she explains her project and what she hopes to accomplish this year. We’re sure it will be a wonderful collaboration and can’t wait to get started! You can see what develops at our Open Lab performance on June 1, 2013 at Wheeler Arts Community in Fountain Square. 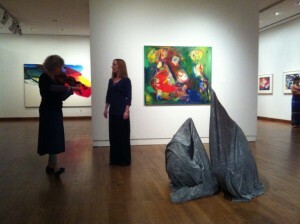 Ellen and violinist Dorothy Martirano doing an improv with dancers Kristin McCoy and Rhea Speights (in bags). Convergence participants will come up with their own experiences with Otherness—either something they have personally experienced or something they have seen or heard about, which will be developed into short scenes. The piece will incorporate musical improvisation with voices, whatever instruments the participants may have, and “found instruments” such as used last year in Tina Chancey’s film score piece. To encourage the importance of sound, a hierarchy will be used that gives singing or Sprechstimme and ambient sung/played sound preference over spoken word. This does not mean that there can be no spoken text, but participants will be encouraged to consider musical alternatives to speech. Movement improvisation and movement phrases will also be used. The final scene will depict a battle between humans and blobs as an allegorical representation of the Other. Half of the participants will be closed up in fabric bags (this is an idea I got from choreographer Kirstie Simson in “COLAB” class) and represent “blobs” while the other half represent humans. We will explore movement in the bags and develop movement patterns that look non-human or do not read as normal human locomotion. Who will win? What will the final outcome be? This is to be determined by the participants!